Proteins are the cells molecular workhorse because they play vital roles in almost all biological processes, ranging from metabolism to immunological responses and cell signaling. It has been estimated that a typical mammalian cell expresses about 10000 to 20000 different proteins and in order to be biologically active they must assume a proper three dimensional structure. How proteins fold into their functional conformation is a central question in biology and not surprisingly defects in protein folding are tightly associated with different degenerative human diseases such as Alzheimer’s, Parkinson’s and Huntington’s. Anfinsen’s pioneering experiments showed that a small, globular protein (ribonuclease A) is able to refold spontaneously into its functional conformation following denaturation, demonstrating that all the information that is required to attain its native structure is determined by the primary sequence (1). Similar results have been obtained for other proteins, thereby firmly establishing that in vitro protein folding is reversible and spontaneous. However, in the crowded cytoplasm of the cell protein folding is assisted by molecular chaperones that welcome newly synthesized proteins and guide it along a productive folding pathway, preventing their misfolding and aggregation. Molecular chaperones are therefore an indispensable part of the cell’s protein quality control system and together with proteases ensure maintenance of protein homeostasis. Within each cell, protein synthesis is carried out by ribosomes that translate the information stored in mRNA into a linear chain of amino acids, while a set of evolutionary conserved molecular chaperones supports de novo protein folding. This network comprises two different groups of chaperones depending on their cellular localization. The first group constitutes chaperones that reversibly associate with the ribosome and nascent polypeptide, controlling early folding events. The second group involves mainly cytosolic chaperones which do not bind to ribosomes and catalyze downstream folding steps. The E. coli chaperone network represents the best studied folding system. Here, nascent polypeptides encounter first the ribosome-associated Trigger Factor (TF) as they emerge from the ribosome. TF was first identified by Bill Wickner and coworkers in 1987 and their subsequent pioneering work established the role of TF as E. coli chaperone (2). TF facilitates the first cotranslational folding steps, while DnaK/DnaJ and GroEL/GroES act downstream of TF and support the subsequent folding events (co/posttranslationally) resulting in the natively folded protein (3). Here, I will discuss the biochemical and structural features of E. coli TF as well as its role in protein folding. TF is only found in bacteria and chloroplasts, while other, unrelated ribosome-associated factors are also present in the cytoplasm of archaea and eukaryotes. In bacteria, TF represents the sole ribosome-associated chaperone with E. coli TF as the best characterized example. It dynamically associates with ribosomes were it binds at ribosomal protein L23 near the exit tunnel (4). TF is therefore uniquely positioned to receive nascent polypeptides that emerge from the exit tunnel and is the first chaperone that interacts with polypeptides early during synthesis. E. coli TF is a cytosolic protein of 48 kDa and is constitutively expressed at high levels. TF is organized into three domains: (i) N-terminal domain (aa 1-149), which is sufficient and necessary for ribosome binding, (ii) middle domain (aa 150-245), exhibiting peptidyl-prolyl cis/trans isomerase (PPIase) activity and (iii) C-terminal domain (aa 246-432) that functions as the main chaperone part of TF. The N-terminal domain contains the so-called TF signature motif (GFRxGxxP), which facilitates association with its docking site at L23 near the exit tunnel (3). Although the middle domain displays PPIase activity, it is not essential for the overall chaperone activity of TF. Interestingly, TF variants containing an intact C-terminal domain display full chaperone activity, while truncations of the C-terminal domain impair its cavity. Structurally, this domain is similar to other chaperone domains, suggesting that it represents a conserved chaperone domain (3,5). Several structures of TF from different bacteria have been solved, including E. coli TF. 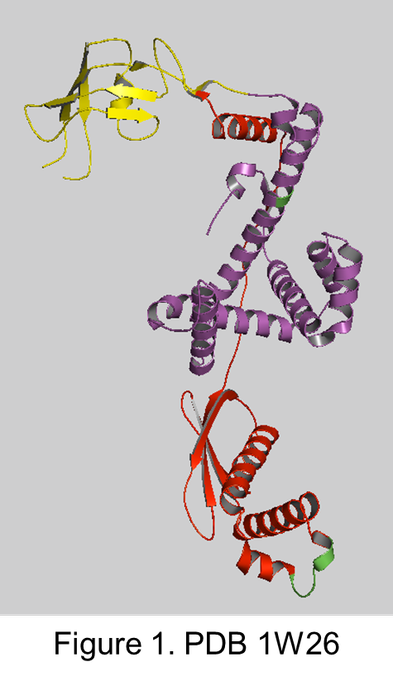 This structure was solved at a resolution of 2.7 Å (6) and is shown in figure 1 with the N-terminal domain in red with TF signature motif in green, middle domain in yellow and C-terminal domain in purple. Overall, TF has an extended structure, resembling a dragon with the N-terminal domain as the tail, the PPIase domain as the head and the C-terminal domain as the body (3,5). The N-domain together with the C-domain forms an open cavity with two arms. TF does not possess a single substrate binding site. Rather, the interior lining the surface of the cavity is used for this purpose. To enable the binding of substrate proteins, the cavity is equipped with multiple binding sites, comprising stretches of hydrophobic and hydrophilic residues. These allow substrate association through hydrophobic and hydrophilic interactions. TF is present in the bacterial cytosol in a 2 to 3 fold molecular excess when compared to ribosomes and exists in a monomer-dimer equilibrium. In its monomeric state, TF binds transiently to ribosomes. The affinity for ribosomes is enhanced by the presence of a nascent polypeptide, suggesting that TF preferentially binds to translating ribosomes. 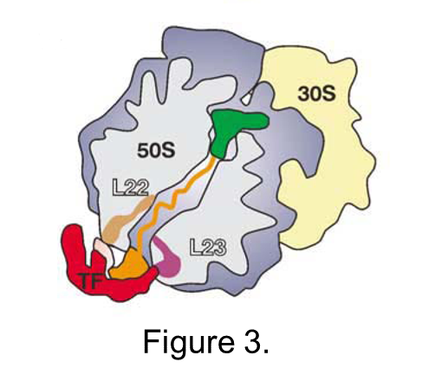 Significant insight in the way TF associates with ribosomes was provided by the structure of its ribosome-binding domain in complex with the 50S large ribosomal subunit (6). 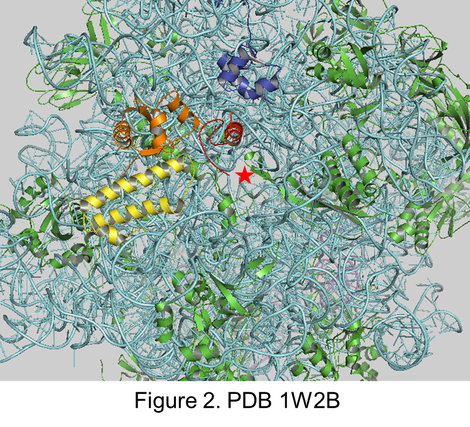 This structure was solved at a resolution of 2.7 Å and includes the ribosome-binding domain of E. coli TF bound to Haloarcula marismortui 50S. This complex is shown in figure 2 and reveals that TF (in red) binds near the exit tunnel (indicated by a star) via its signature motif, contacting L23 (in orange) , L29 (yellow) and L19 (blue). RNA is in blue and non-interacting proteins are in green. In this way, TF ideally positioned to receive nascent polypeptides emerging from the ribosome (figure 3, adopted from 6). The available structural data suggest that TF arches over the exit tunnel, forming a protective folding space were nascent polypeptides are shielded from proteases and aggregation. Although these structures provide a static picture, a comparison of the different structures of ribosome-bound TF indicates that this chaperone is actually quite flexible, enabling it to accommodate diverse nascent chains (3,5). Ribosome-bound TF prevents premature and incorrect folding of nascent polypeptides. TF is able to accommodate protein domains or small proteins of up to 130 residues in its interior. A recent study employing cryo-electron structures of TF bound to ribosomes in combination with molecular dynamics simulation confirmed the dynamic behavior of ribosome associated TF, including conformational changes upon ribosome binding (7). Based on this a model was put forward, suggesting that TF is bound to the ribosome as a flexible chaperone. Upon elongation of the nascent polypeptide, it gains in rigidity and dissociates from the ribosome while remaining bound to the polypeptide as a holdase or foldase. According to the structural evidence, L23 is the docking site for TF. However, SRP (signal recognition particle) also binds at this protein (8,9). In E. coli, SRP binds to hydrophobic transmembrane domains (TMD) early during biosynthesis and facilitates the cotranslational targeting of newly synthesized membrane proteins to the insertion site located in the cytoplasmic membrane. Photo cross-linking experiments suggested that TF initially interacts with nascent membrane proteins. However, when a TMD emerges from the exit tunnel, SRP is recruited to the translating ribosome and associates with the TMD, replacing TF. Binding to TF is restored, unless another TMD emerges from the ribosome (10). The shared docking site by TF and SRP raises the question whether these factors can bind simultaneously to L23. This is not yet confirmed by structural studies, although two biochemical studies showed that TF and SRP can be detected together on ribosomes (11, 12). This finding is consistent with a model in which TF and SRP are present together on the ribosome, while SRP samples nascent polypeptides for the presence of a TMD as they emerge from the exit tunnel (12). Using an in vitro translocation assay, Bill Wickner and coworkers showed for the first time that TF functions as a chaperone by maintaining E. coli secretory proteins (e.g. OmpA) in a translocation competent state (13). Based on these findings it was suggested that TF is specific for exported proteins. However, more recent genetic experiments revealed a general role of TF in the E. coli chaperone network. It was shown that individual deletion of the genes that encode TF or DnaK does not affect the viability of E. coli cells, while simultaneous inactivation of these genes is deleterious at growth temperatures above 30oC. This growth defect can be suppressed by overexpression of the GroEL/ES system (5) because of functionally overlapping chaperone systems. A general role as chaperone is, moreover, supported by photo cross-linking studies, showing that TF initially interacts with nascent polypeptides of cytosolic proteins, membrane proteins and exported proteins (10). Further insight into potential substrates of TF as well its physiological role of TF was provided by proteomics studies. Firstly, analysis of protein aggregates isolated from E. coli mutant cells devoid of TF and DnaK, showed that these aggregates contain more than 300 proteins involved in a variety of biological processes (14). The size of these proteins ranges from 16 to 140 kDa with multi domain proteins remarkably abundant. Secondly, assessment of the GroEL interactome suggested that this comprises about 250 proteins and this number increases in E. coli mutant cells devoid of TF and DnaK, pointing towards common substrate proteins (15). Finally, the effect of the absence of TF on the E. coli transcriptome was investigated recently (16). This showed that the transcriptome is dramatically affected in the absence of TF as evidenced by the altered gene expression of chaperones as well as changes in RNA levels of genes involved in different biological processes. These findings emphasize the key role of TF in the E. coli chaperone network. In all kingdoms of life, nascent polypeptides interact with chaperones, folding catalysts, modifying enzymes and targeting factors as they emerge from the ribosomal exit tunnel. These factors act as the nascent chain welcoming committee and are crucial for the final location and structure of the newly synthesized protein. In eukaryotes, the nascent chain welcoming committee comprises the so-called ribosome-associated complex (RAC) and nascent chain-associated complex (NAC), which are made up of different proteinaceous factors, including chaperones (5). In E. coli, all nascent chains are initially greeted by TF as they exit the ribosome. SRP displaces TF upon emergence of a TMD and guides the nascent membrane protein cotranslationally to insertion site located in the cytoplasmic membrane. Following chain elongation, further folding is assisted by DnaK/DnaJ as well as GroEL/GroES (3,5). Despite the wealth of structural and biochemical knowledge, many questions remain about the molecular mechanism of TF and how the interplay with other chaperones and targeting factors is coordinated. A high resolution structure of a ribosome together with TF and SRP would in this respect be most welcome. Remarkably, TF is in two to three fold molecular excess over ribosomes in the bacterial cytosol, which ensures that all ribosomes are saturated with TF. However, this also indicates that not all TF is bound to ribosomes. While the role of ribosome-associated TF during co-translational folding of nascent polypeptides is well established, the function of ribosome free TF is not fully clear yet. However, ribosome free, dimeric TF has been implicated in ribosome assembly and preventing protein aggregation (3,5). Classical genetics, global analysis of chaperone networks and transcriptome studies have confirmed that TF is a central component of the E. coli chaperone system and functionally overlaps with these networks. However, many questions remain about how TF selects and binds substrates and prevents their aggregation. Recently, the NMR structure of TF with an unfolded substrate (PhoA) was presented, providing significant insight into the mechanism of substrate recognition and binding (17). Specifically, TF uses multiple sites to bind substrates mainly through hydrophobic interactions. This multivalent binding ensures that the substrate protein is maintained in an extended, unfolded state. Clearly, a detailed crystal structure of TF with different substrate proteins would be of utmost value to establish the mechanistic aspects of substrate binding and preventing their aggregation. 1. Anfinsen, CB. 1973. Principles that govern the folding of protein chains. Science. 181: 223-230. 2. Crooke, E. Wickner, W. Trigger factor: a soluble protein that folds pro-OmpA into a membrane- assembly-competent form. Proc Natl Acad Sci U S A. 84: 5216-20. 3. Hoffmann, A. Bukau, B. Kramer, G. 2010. Structure and function of the molecular chaperone Trigger Factor. Biochim Biophys Acta. 1803: 650-61. 4. Kramer, G. Rauch, T. Rist, W. Vorderwülbecke, S. Patzelt, H. Schulze-Specking, A. Ban, N. Deuerling, E. Bukau, B. 2002. L23 protein functions as a chaperone docking site on the ribosome. Nature. 419: 171-174. 5. Preissler, S. Deuerling, E. 2012. Ribosome-associated chaperones as key players in proteostasis. Trends Biochem Sci. 37: 274-283. 6. Ferbitz, L. Maier, T. Patzelt, H. Bukau, B. Deuerling, E. Ban, N. 2004. Trigger factor in complex with the ribosome forms a molecular cradle for nascent proteins. Nature. 431: 590-596. 7. Deeng, J. Chan, K.Y. Van Der Sluis, E.O. Berninghausen, O. Han, W. Gumbart, J. Schulten, K. Beatrix, B. Beckmann, R. (2016). Dynamic Behavior of Trigger Factor on the Ribosome. J.Mol.Biol. 428: 3588-3602. 8. Kramer, G. Rauch, T. Rist, W. Vorderwülbecke, S. Patzelt, H. Schulze-Specking, A. Ban, N. Deuerling, E. Bukau, B. 2002. L23 protein functions as a chaperone docking site on the ribosome. Nature. 419: 171-174. 9. Gu, S.Q. Peske, F. Wieden, H.J. Rodnina, M.V. Wintermeyer, W. 2003. The signal recognition particle binds to protein L23 at the peptide exit of the Escherichia coli ribosome. RNA. 9: 566-573. 10. Ullers, R.S. Houben, E.N. Brunner, J. Oudega, B. Harms, N. Luirink, J. 2006. Sequence- specific interactions of nascent Escherichia coli polypeptides with trigger factor and signal recognition particle. J Biol Chem. 281: 13999-14005. 11. Raine, A. Ivanova, N. Wikberg, J.E. Ehrenberg, M. 2004. Simultaneous binding of trigger factor and signal recognition particle to the E. coli ribosome. Biochimie. 86: 495- 500. 12. Buskiewicz, I. Deuerling, E. Gu, S.Q. Jöckel, J. Rodnina, M.V. Bukau. B. Wintermeyer, W. 2004. Trigger factor binds to ribosome-signal-recognition particle (SRP) complexes and is excluded by binding of the SRP receptor. Proc Natl Acad Sci U S A. 101: 7902- 7906. 13. Crooke, E.B. Wickner, W. 1987. Trigger factor: a soluble protein that folds pro-OmpA into a membrane-assembly-competent form. Proc Natl Acad Sci U S A. 84: 5216-520. 14. Deuerling, E. Patzelt, H. Vorderwülbecke, S. Rauch, T. Kramer, G. Schaffitzel, E. Mogk, A. Schulze-Specking, A. Langen, H. Bukau, B. 2003. Trigger Factor and DnaK possess overlapping substrate pools and binding specificities. Mol Microbiol. 47: 1317- 1328. 15. Kerner, M.J. Naylor, D.J. Ishihama, Y. Maier, T. Chang, H.C. Stines, A.P. Georgopoulos, C. Frishman, D. Hayer-Hartl, M. Mann, M. Hartl, FU. 2005. Proteome- wide analysis of chaperonin-dependent protein folding in Escherichia coli. Cell. 122: 209- 220. 16. Fan, D. Liu, L. Zhu, L. Peng, F. Zhou, Q. Liu, C. 2017. Global Analysis of the Impact of Deleting Trigger Factor on the Transcriptome Profile of Escherichia coli. J Cell Biochem. 118: 141-153. 17. Saio. T, Guan. X, Rossi, P. Economou, A. Kalodimos, C.G. 2014. Structural basis for protein antiaggregation activity of the trigger factor chaperone. Science 344: 597-612.